This section of the website provides resources for people who want to learn more about the MacFarlane Collection and the Anderson River Inuvialuit. It includes Teachers' Guides and interactive Lesson Plans so that teachers can use this website to help students gain knowledge and appreciation of Inuvialuit culture and heritage. This section also presents the results of our Inuvialuit Sewing Project, including an image gallery of "recreations" of Inuvialuit clothing in the MacFarlane Collection. 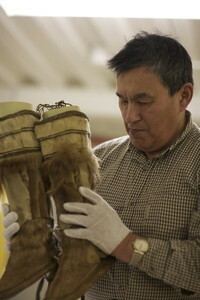 Finally, we have listed references and uploaded reports and articles (where permissions have been granted) relating to Inuvialuit culture and history, the MacFarlane Collection, and to this project.